Casa Cruz is a beautifully, traditionally renovated Cortijo nestling in the valley between the villages of Fuente del Conde and Villanueva de Tapia. The guest accommodation has been carefully renovated to blend with nature whilst providing a discerning level of comfort. Small details have been included to delight and surprise you and a large private pool is a welcomed treat. 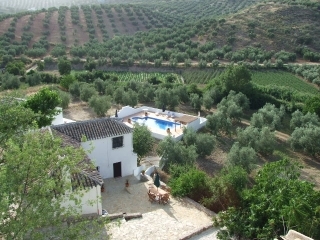 The properties are set in 19,000m2 of olive groves and fruit trees with pleasant landscaped areas to enjoy. Both properties have their own BB Q's and terraces with steps leading to the private, walled pool area. The pool is 11m x 5m surrounded by a large terracotta terrace with sun loungers, tables and chairs and a pergola offering welcome shade in the hot summer months. In addition to the proximity of the cities of Granada, Malaga and Cordoba there some special interest activities nearby. Horse-riding stables are just a 10min drive from Casa Cruz to Salinas, offering facilities for all ages and abilities. The area is renowned for having the highest concentration of bird species in this part of Europe and there are locally organised bird-watching and walking tours, details of which can be obtained from the owner. If you have a particular desire to explore different activities e.g. painting, ceramics etc... the owner has a good network of local contacts which he will happily provide you with.